Catholic Schools Week is fast approaching (some celebrating this week, some celebrating next week) and this is the perfect time to celebrate Catholic education in the United States. Each school celebrates differently but there are often open houses, Masses, and whole school celebrations. 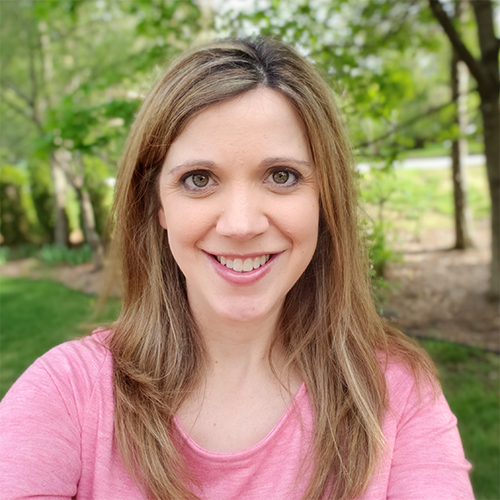 I noticed that Brooke from Countless Smart Cookies posted on Instagram that she and a friend were doing a linky party and a giveaway for Catholic schools week. 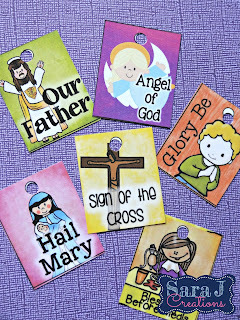 I decided it would be a great time to showcase some of my Catholic products including a FREEBIE for helping students to pray. Any of these products could be used in a Catholic school, an after school religious ed program or even in a homeschool environment. I'll link them all to the longer blog posts where I went into more detail explaining how I use them if you want more information. How are you celebrating Catholic schools week where you teach? 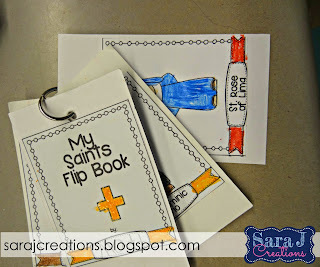 Last year, we decided to add a saint study to our curriculum as a way to tie virtues into our lessons each week. We focus on a different saint, give a few facts about them and talk about the virtue that they represented. Last year, we did these on index cards and students made a key ring of saint cards. 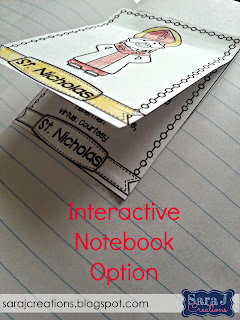 This year we have them in notebooks so they are like little interactive notebooks. There are so many different ways to use them and I'm sure I'll try a different way next year too! Click HERE to read more about how I use the Saint cards. After our push to learn more about the saints and their virtues, I had to add a little fun with the saints. I decided to make saint bingo and at the request of a customer I added little facts about each saint to use as clues. The problem was that it was a lot for my first graders to handle when there were 25 spaces and they couldn't all read the names of the saints in regular Saints Bingo. I made a junior version for them so they only had 16 saints to look through as we played bingo. Click HERE to read more about Catholic Saint Bingo. This lapbook has really helped my students with memorizing prayers this year. In the past I would hand out one prayer at a time and wait until most of my students memorized it until we moved on. The problem was it was holding back my students who loved learning new prayers. 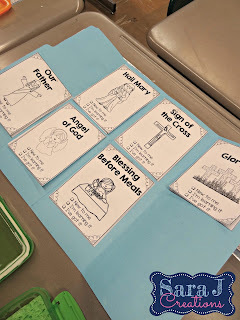 Now we create this at the beginning of the year and students work at their own pace to memorize their prayers. 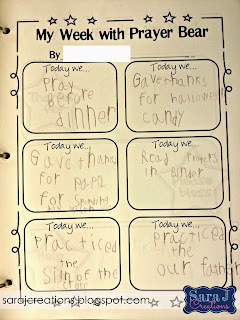 They have a tool to practice at home and I know that they all have the correct version of each prayer at home with them. No excuses! Go HERE to read more about how I use Catholic Prayers Lapbook. These reward tags (or STAR tags as I call them in the classroom but sometimes go by brag tags, behavior tags, etc.) have changed my class this year for the better. I use a tag as a reward for each prayer my students memorize. They LOVE it and love earning tags and I love not dumping money into a treasure box of junk. I also use them to reward positive behavior. My students proudly wear their necklaces during class and love to earn more. I also give them a tag after each lesson we do to help initiate a discussion at home about what we learned that day. I love using these and can't say enough about the difference it has made in my classroom each week. 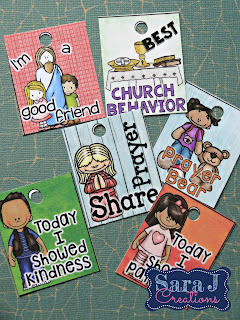 Go HERE to read more about how I used Catholic Reward Tags. Prayer Bear is one of my favorite ways to encourage young learners to pray at home. We have a bear that travels to each students' house for a week. Prayer Bear is supposed to remind them to pray and give them someone to pray with. A binder accompanies Prayer Bear with prayer prompts and directions so each family knows the expectations. These are FREE if you want to try out prayer bear with your students. My kiddos are so excited each week to see if they are the lucky one who gets to take Prayer Bear home. Hopefully for the students who have no prayer life at home, this gives them a little bit of encouragement and motivation. 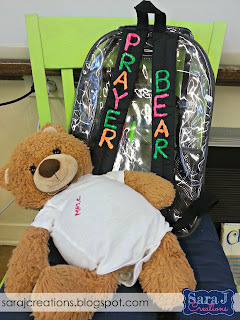 Click the pictures to download your free pages for a Prayer Bear Binder or go HERE to read more about Prayer Bear. If you are interested in seeing more ideas for Catholic schools week and being entered into a drawing for FREE Catholic products, head to Countless Smart Cookies to see more.